If you’ve never worked with or been around horses before, and you find yourself with an inquiry sitting in your inbox for a session with one, there are certain things you need to know. Sessions with horses are a completely different ball game than shoots with only people, or even dogs. Unlike most dogs (there are always exceptions to the rule of course), working with horses can be extremely dangerous if you don’t know what you’re doing. By following the guidelines below, you can be sure to have a successful, and safe session even though you aren’t experienced with horses. Be upfront with your client right from the start. Never ever let your client assume that you’ve worked with horses before if you haven’t. Instead, let her know that you are inexperienced, but you’re willing to work with her to be sure she gets what she wants out of her session and no one is put into a dangerous situation because of your inexperience. Recommend your client invite a friend or family member who IS experienced with horses to come along to the session to help out. Photographing a person with a horse is a lot to handle at once, especially for a photographer who isn’t used to doing it. Not only do you have to worry about posing two different subjects, but one subject is an unpredictable animal who doesn’t always want to follow your instructions. If your client has to be the one to walk her horse to and from the locations and reposition him/her for each shot, she is most likely going to end up getting dirty, which isn’t good for the images. By having someone else there who knows how to handle horses, you can keep your client clean for the photos without having to work with the horse yourself. Never walk directly behind a horse. Every horse is different, so some will be more likely to kick you if you walk behind them, while some are fine with it. As a general rule for safety, just don’t do it. Before you begin shooting (preferably before you even arrive to the session), you need to specifically ask your client if her horse is particularly spooky about certain things. If you shoot with flash, ask her if the horse will be fine with it. If you shoot with a reflector, ask if her horse would spook at it. You get the idea. “Spook” means to be startled or afraid of something, which you never want to happen at your session. A spooky horse is nearly impossible to get good images of if you are waving a reflector in his face the entire session. You want the horse to be as calm and relaxed as possible, so you’ll need to work closely with your client to design a session experience that allows for that. As you are shooting, you need to always be aware of the horse’s expression. Your client will be looking for images with the horse’s ears up and paying attention, not a disinterested horse with his ears back and a grumpy expression on his face. This is where that friend/family member assistant also comes in handy. Have them either wave a plastic bag around or shake a feed bucket for each shot to get the horse’s ears up. If the client said her horse tends to be spooky, you’ll want to start with an attention getter that isn’t scary. So use the feed bucket instead of a plastic bag. 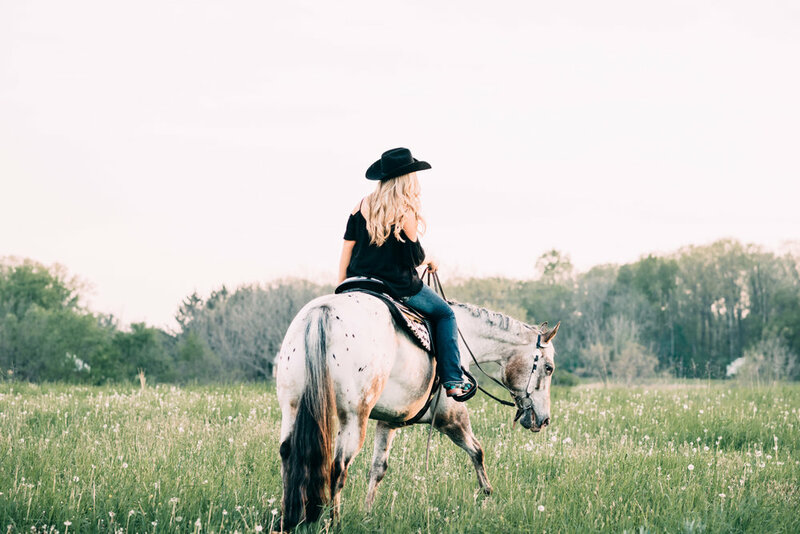 Always start with the smallest possible attention getter, so as the horse gets bored, you can work up to something that is more exciting and get’s them to perk up again. Bad expression: ears back and uninterested. Good expression: ears forward, paying attention and interested. 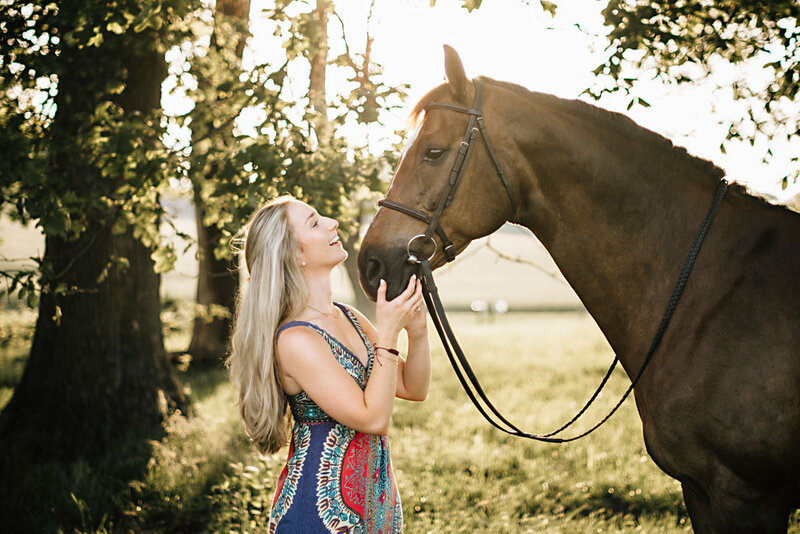 Photographing with horses can be a little nerve-wracking if you’ve never worked around horses before, but as long as you follow the guidelines above and work closely with your client, your session experience should go smoothly and you should end up with gorgeous images.